Wishes can come in all shapes and sizes. One doesn’t have to be diagnosed with an illness to qualify for ElderVentures, and every resident is encouraged to share their thoughts. A wish can be for something to benefit their lives, to fund a new venture, to experience a lifetime event or milestone, to fulfill an unmet need, to travel to a special place – you name it; the possibilities are endless. Dreams are not based on financial need. 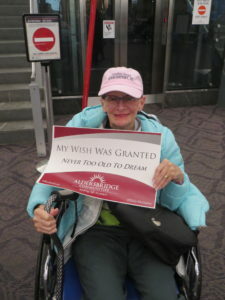 All wishes are approved by ElderVentures Wish Granting Committee. Costs associating with wishes granted average $500. 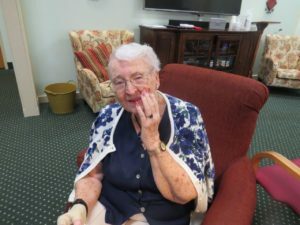 Emmalou wished for a replica of her unique engagement ring from her late husband, Otto. With the help of M.R.T. Jewelers, Emmalou’s ring was replicated from her memory: a 6-carat, high-quality emerald cut amethyst set in a four-prong setting on a 14K yellow gold band. Ginny’s wish was to travel to New York to visit her brother all by herself. Dan’s wish was to attend a concert at Fenway Park with his children. On August 10th, 2018, Aldersbridge Communities made that wish come true. 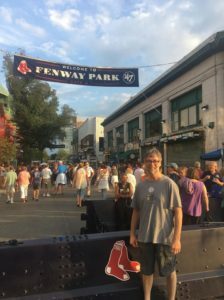 We sent Dan and his kids to see Billy Joel at Fenway Park, and they reported to have had great seats, and an excellent time together. Residents, perhaps with the help of their caregivers, are asked to make their dream or wish known to the administrators of our Communities. A form is provided to enable the gathering of details and information. A special committee will review the request for final approval and coordination. Based on budgetary and logistical constraints, every effort is made to make each dream possible. The goal of ElderVentures is to enable our residents to live with purpose, to enrich their lives to the fullest, to enable self-actualization, and add life to their years. When there is something to live for – even if it’s just a hope – one’s life has meaning. Granting wishes is heartwarming and extremely rewarding on many levels. Imagine having the power to make someone’s dream come true! Your gift can offer hope and happiness and fulfillment to a life well-lived or for someone who may not have the funding or ability to make their own dreams come true. Our goal is to keep the program funded so all wishes can be granted and in a timely fashion, as often as possible. Thank you for your consideration and support of this amazing and life-changing program.